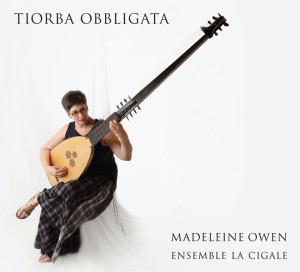 This colourful recording showcases the art of the obbligato theorbo—virtuosic solo writing for the theorbo, with and without accompaniment, from 17th‑century Italy. Madeleine Owen’s masterful and sensitive performance is supported by ensemble members Sara Lackie on Baroque triple harp, Elin Soderstrom on viola da gamba, and Vincent Lauzer on recorders. The selections featured on the recording, by Italian theorbo masters Giovanni Pittoni Ferrarese, Giovanni Girolamo Kapsberger, and Alessandro Piccinini, are not widely heard today, and several of these pieces have never been recorded before. The mastery and sensitivity of Madeleine Owen on theorbo are highlighted by the nuanced support of the ensemble members…. 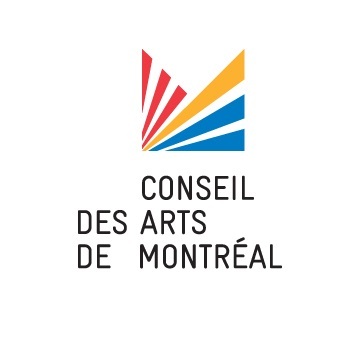 [F]or once, the continuo is more rich than the dessus, as if a colourful carpet was rolled out beneath the melody. The plucked strings complete each other harmoniously…. 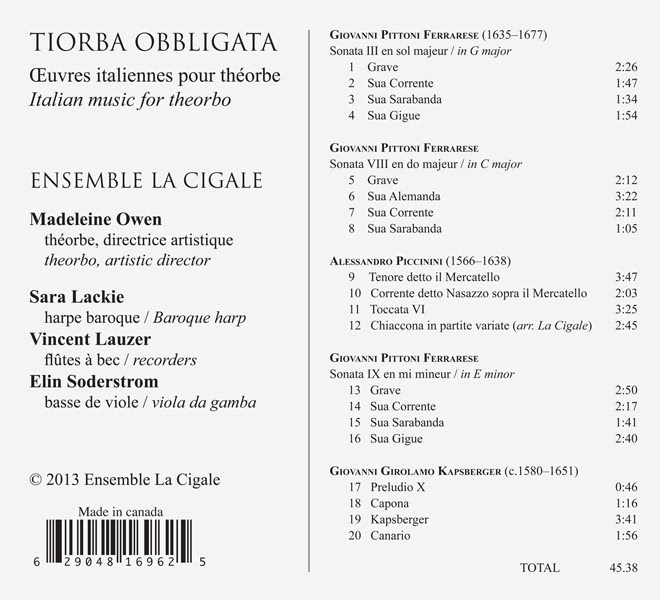 The principal value of a release like this, aside from the obvious one of hearing good music well played, is that it brings to us a delightful slice of early Italian repertoire, the composers of which are unfamiliar to anyone who doesn’t study the music of the early and mid-17th century in considerable detail. There is an energy and richness to the sound Ms. Owen elicits from the instrument that immediately attracts us, especially in combination with other instruments. 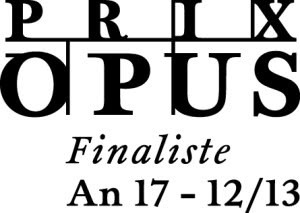 I particularly liked the sound of the theorbo with the harp, two instruments of such similar timbre that it would be easy for each to lose its identity in the texture, but somehow that doesn’t happen. Also, Vincent Lauzer’s impeccable recorder playing merits special mention. … [T]he four-movement major-key suites in particular are pure charm, full of Italian sunshine, a delight from beginning to end, by turns lyrical and stately. There is some quirkiness too, notably in a G major gigue in 12/8 time, and one in E minor with a melodic line that rolls on and on. 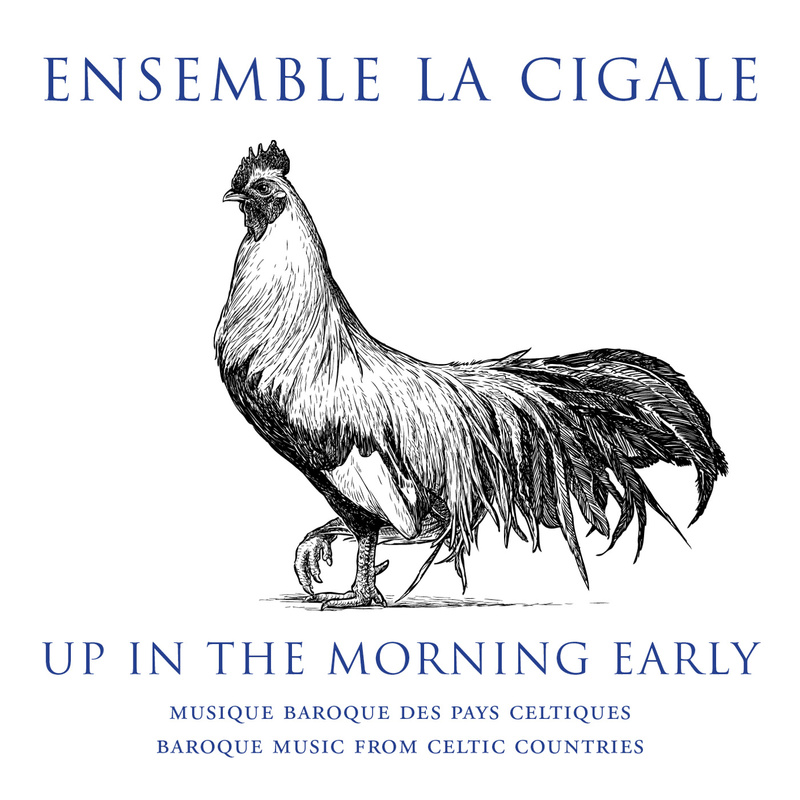 The ensemble have chosen to perform these with continuo realised on baroque harp, making the recording a plucker’s delight, and just some of the staff notation treble lines played, on recorder…. [A]ll the playing is musical, with good light and shade. 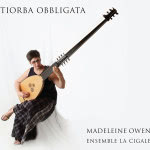 Madeleine Owen is capable of both full-blooded and passionate playing (evident in the Piccinini), and of delicacy (for instance in a sensitive rendition of the Kapsberger Preludio). 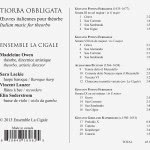 Tiorba Obbligata can be purchased here through PayPal, or in digital format at iTunes and CD Baby.